The scenes that were being shown last night on news shows were ghastly; but they were – likewise – very familiar. We have all seen those before. 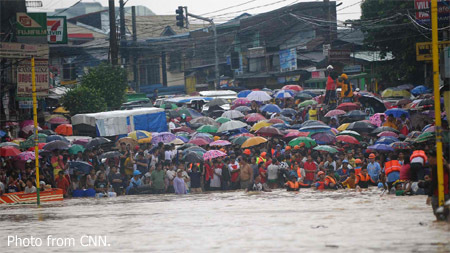 Torrential rains, rivers overflowing, streets flooded with murky waters and people trapped on their rooftops. Ondoy revisited. While the news videos preferred to talk about the tragedy that befell people – and flooded cities are nothing if not tragic – I preferred to see the heroism of our men in uniform and the local government personnel that they worked with. To a certain extent, the plight of those who had to be rescued was self-inflicted. In all instances, warnings to evacuate were issued hours before. Those that were trapped were the ones who refused to leave; although of course one cannot blame people for wanting to keep watch over their properties. 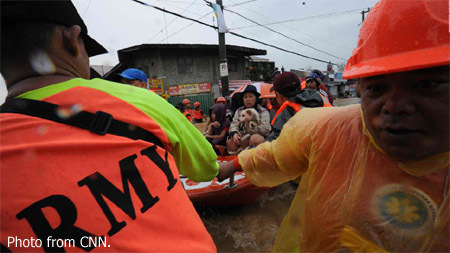 At any rate, the men from the Armed Forces, the Philippine National Police and those from various government units and agencies went about their business of rescuing citizens non-judgmentally, professionally, cheerfully and with an obvious desire to be of service to the public. Mind, being soaked and cold in wildly-rushing floodwaters cannot be fun. Too often, perhaps, we are told of men in uniform or even many in government whose idea of public service is either to empty the coffers for personal benefit or to be right behind crime syndicates. Well, last night, in the warm comforts of our living rooms, we became privy to the other side of our soldiers, policemen, fire-fighters and local government officials. What can I say? I am humbled by such acts of selfless courage and proud that they are my countrymen. 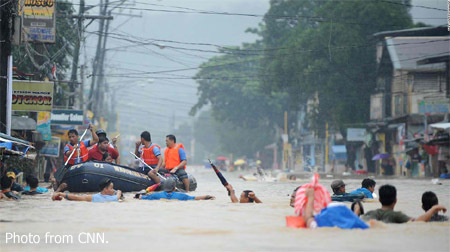 If there is one thing that the Aquino government deserves praise for, it is its proactive attitude towards disaster management. It is no secret that the country is right along typhoon alley as well as part of the Pacific ring of fire. What pleases me no end is that government acknowledges this and is more prepared than it ever has been for the tantrums that Mother Nature rather tends to have once in a while. 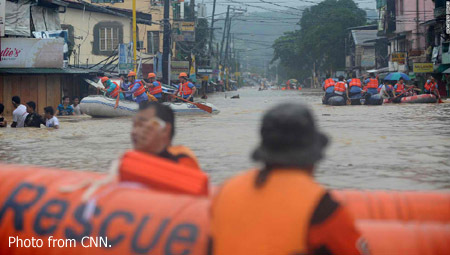 Warning systems are in place and disaster preparedness protocols are quickly executed all the way to barangay level. I see training exercises being held even on the regional news. What can I say? Admirable! Simply admirable! When the disasters do occur, everything naturally depends on those who are on-site. Yesterday, they did not disappoint. In fact, as everyone saw from the news videos, they made an entire nation proud!